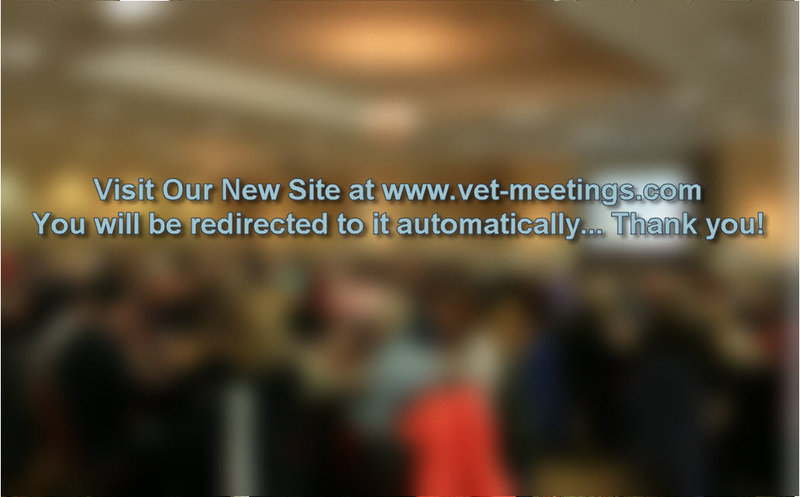 Thank You to All the Attendees, Speakers, Exhibitors and Guests for making the 2019 Mountain Veterinary Conference a Great Success! This Conference continues to grow, and we will be working hard to make next year's conference even better. 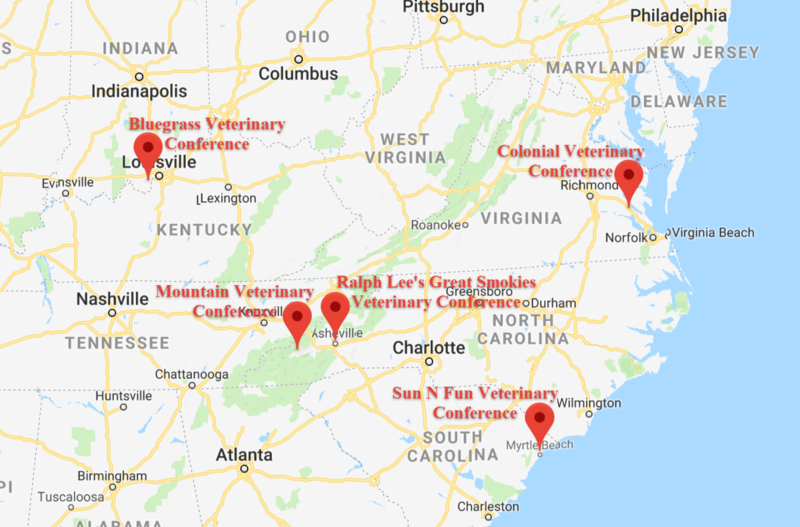 The 2020 Mountain Veterinary Conference will be held on April 19 - 22, 2020 at the same location, Harrah's Cherokee Casino Resort! The North Carolina Veterinary Medical Board now requires 2 hours of CE on controlled substance abuse in the 2019 calendar year for 2020 license renewals for all veterinarians and technicians. Joseph Jordan, PhD, CEO, NC Physicians Health Program, NC Veterinary Health Program will provide a 2 hour CE session on "Recognizing and Dealing with Substance Abuse in the Workplace" on Wednesday, April 10 at the Mountain Veterinary Conference. "At the beautiful Harrah’s Cherokee Casino Resort"
$20 free slot play for each attendee to be used at their leisure. Room rates start at $129 + tax (standard room, April 7th - April 9th) and rate guaranteed until March 20, 2019. Drs. Dohmen and Wentzel will be co-hosting an herb walk in the Great Smokey Mountains National Park. Chronic vaginitis and incontinence; can surgery help? Regenerative Medicine, It’s Not "Just" For Doctors: Learn Technician Utilization Through the Science of Rejuvenation. Common Orthopedic Injuries in Small Animals And How We Can Best Provide Patient Advocacy At All Price Points. Pulse Electromagnetic Frequency Therapy (PEMF), The Science Behind the “Voodoo." Secure vs Not Secure what does this mean for my website? Breakfast Session (7:30-8:30am) - Rod Finnegan, Sponsored by Vet Insure: "Destroyed in Seconds: How to Protect Yourself from Peril & Litigation in the Age of Entitlement"
Lunch Session: Mr. Aaron Bakken, Sales Director, K-Laser: "Successful laser therapy implementation; A detailed guide to successful LTP implementation in your practice"
Most skin and subcutaneous tumors can be cured with surgery alone if diagnosed early when tumors are small. To do this we need to identify and diagnose skin and superficial masses with aspirates and biopsies when they are more treat. See Something, Do Something. Why Wait? Aspirate® is a cancer awareness program to do just that. In this talk we will go over the guidelines and the dive into the common lump and bumps on cytology. 10:15-11:30am: What’s New in Cancer? This lecture will focus the latest diagnostics and treatments in oncology including vaccine immunotherapy for osteosarcoma and lymphoma, the newly approved chemotherapeutic Tanovea, CADET BRAF testing for bladder tumors, and new medications. We will cover additional topics based on what’s current at the time of the meeting. Once you’ve confirmed the diagnosis of lymphoma, the diagnostic and chemotherapy options can be budget busting for many clients. Which tests and protocols do we recommend? What do you tell the owners? This lecture will give a practical approach to diagnostic and treatment options at various price points. We will cover the numbers and prognoses you need to know when you talk the owner about the options. We will also discuss new therapies available and how to use steroids when treatment is declined. This lecture will cover both low grade and high-grade gastrointestinal lymphoma, and the challenges of distinguishing low-grade lymphoma and IBD. This lecture will give a practical overview of diagnostics, picking staging tests, which ones to skip, treatment options, and statistics you need to know when you talk the owner. We will also discuss steroids when treatment is declined. Cats are definitely not small dogs when it comes to lymphoma. Wish your dogs were calm, relaxed and interested in following your lead? Want to offer clients behavioral help that doesn’t involve medication and isn’t dependent upon trainers? It all comes down to canine-centric communication and social cues (plus some well-timed smiles)! Dogs communicate with each other using posture, position, movement and energy, and they are as aware of our posture, choice of position, movement and energy (in quality and quantity) as they are of each other’s. Veterinarians and staff who understand common canine social rules and who utilize their body language well (whether or not they are holding a leash) are in a very good position to bring out the best in their dogs. This practical session will help participants understand the ‘what’s,’ the ‘how’s’ and the ‘why’s’ of communicating with canines. Participants will learn how dogs view their body language, and they will be better prepared to lead the dogs in their care. A bark isn’t a bark isn’t a bark. To set limits (or totally eliminate) unwanted barking, it helps to understand what a dog is trying to tell you. Dogs bark for a number of reasons, and one response doesn’t fit all. How we identify and respond can determine whether it takes the form of one bark or two, a three- dog discussion or a ten-dog, ten-minute canine chorus. Aggression isn't aggression isn't aggression. As a means of canine communication, aggression is most often situational and therefore reversible. Identifying the underlying trigger and a dog’s state of mind is pivotal in each and every case. Are his actions defensive (as in fear aggression), offensive (as in dominance aggression), an element of his DNA (think: hormones or prey drive) or simply a response to his circumstances? Is his mind ‘in the moment,’ or are his actions rooted in prior associations? Misinterpret the underlying issue or a dog’s state of mind, and your response can increase his aggression and not decrease it! Let us help you troubleshoot what’s really going on. Participants will learn why ‘a bark isn’t a bark isn’t a bark’ plus calm positive responses to common kinds of barking that sets limits on it. Participants will learn thirteen situations where canine aggression commonly occurs and proven, practical, positive ways to prevent dogs from crossing the line. This includes resource guarding, a situation that is easy to address once certain concepts are understood. For practical information on canine behavior and what humans can learn from it, visit www.givesmiles.us . This lecture will discuss using food as medicine, with and without herbs. We will briefly discuss homecooking for pets, both healthy and with chronic disease. This lecture will go over the basics of medicinal use of Western Herbs. The concept of Evidence-based Medicine will be introduced. We will discuss how herbs can be used in terms of physiology, treatment modalities, safety and interactions. How to read a monograph will be explained, and there will be cases presented. This lecture will start with a detailed explanation of adaptogens as an herbal group. Monographs of 8-12 herbs will be presented. There will also be an organoleptic component to this lecture, with tasting of the herbs dried and in tincture. In this lecture, we will go through how to put together an herbal formula. Things to consider include: type of administration, type of herb, number of herbs, specifics of patient, environment and speed of delivery. We will also discuss the determination of dosage, and the many methods to decide on a dose. There will be case examples of formula preparation. Lastly, herbal labeling will be detailed. Prophylactic gastropexy; yes or no? Chronic Cough In The Dog; Update On FELV & FIV Feline Viral Upper Respiratory Disease…Why It Persists! Constantine is the south-central zone business development consultant working with Business Owners to provide comprehensive benefits for their employees as well as their individual needs. Constantine Zourzoukis joined New York Life as an agent in the Greater Washington General Office in 2011. Bringing with him over 20 years of extensive management experience to helping to position the value of employee benefits and the impact it provides in boosting employee morale and retention. Constantine became a leading agent earning honors as top benefits producer, winner of the Life Foundation Award and recognized a Centurion agent. Constantine was promoted to South Central Zone Business Development Consultant in 2014. Constantine now works on a regional scale helping to impact employers and their business in the changing business landscape. Recently recognized as one of the top Zone Consultants with in New York Life in 2018. Constantine continues to message New York Life’s mission to provide financial security and peace of mind through our products and services. The long-term view and core values of humanity, integrity and financial strength associated with that mission underscores our Company’s genuine concern for the markets and environments in which we do business. Every decision we make, every action we take has one overriding purpose: To be here when our customers need us. You have just made the diagnosis for cancer in your canine patient. Now what do you tell the client? This lecture will cover 4 common cancers and the information you need to tell owners including the necessary (and not necessary) diagnostics, treatment options, survival times with and without treatment, supportive care options, and prognosis. You have just made the diagnosis for cancer in your feline patient. Now what do you tell the client? This lecture will cover 4 common cancers and the information you need to tell owners including the necessary (and not necessary) diagnostics, treatment options, survival times with and without treatment, supportive care options, and prognosis. Metronomic chemotherapy – aka low dose oral chemotherapy - is a newer way of administering old chemotherapy drugs but targets tumor cells in a completely different way than conventional chemotherapy. In this case-based lecture, we will discuss all you need to know about this lower dose, lower risk and often lower cost approach. We will also discuss which cases you should consider it, including cases with advanced metastatic disease – yes there are treatment options for these cases. When we tell a client their pet has cancer, it is like dropping a bomb. It is not what you tell an owner about their pet’s cancer, it is how you say it. In my opinion, how you break the bad news is more important than what you know about that cancer. No one likes to break bad news, but it is a complex communication skill that you will have to do thousands of times. In this talk, we will discuss cancer communication challenges for you and the client, and practical strategies that you can use in your practice the next time you have to break any bad news. Projects, people, changing regulations, inventory… so many wandering cats! Everything is important and tracking them all requires a solid plan with good tools. Delegation can be tough for those who fight to stay in control. It can be worrisome if things are not done appropriate and the manager still answers for those delegated tasks. Every team has a personality of its own. Facility issues vary, inventory needs change but must be tracked and just keeping the right people in place is an ongoing issue. These cats can be herded. We do not have to live stressed, out of control lives. 10:15-11:30_Why Would they think that is ok? There are several common areas of concern that we share across size, region or plans. Consider the existence of these problems in your hospital; accountability lapses, lack of training, enforcing the rules and friendly or friends? I am a certified veterinary practice manager, an experienced hospital administrator and an adjunct instructor on veterinary management. And yet I still find that these problems persist in my practices. The reason seems to be that we still hire people and people are an ongoing challenge. We will look at solutions in each area. Practices spend a lot of time looking for the right team member. Without a plan, managers are destined to repeat a futile cycle of hiring, training, counseling, and firing that frustrates everyone. Experience has taught that you really don’t want everyone. Take a little time to think about what the team needs and what your clients want. Having a plan will help you not take the first person that comes along. Veterinary experience is nice but may not be the deal breaker that some think. This session will look at a process that gets the right people hired and to build them into the team that best fits your practice and your clientele. 2-2.50 pm _Employee Benefits - what do they want? There is a lot of speculation about employee benefits in all workplaces and veterinary practices are no exception. Different generations in the workplace impact benefit choices and must play a part in determining what is offered to employees. To Baby Boomers, insurance equates to security and Boomers expect a “good employer” to offer a full lineup of health, dental, and retirement options. Younger employees just starting out in life may see time off or opportunities to learn and grow in their chosen field as more important. Creating a benefit package that will attract the employees you want requires a plan. This session will look at not only traditional benefits but some creative options to get you noticed in this hiring world. We are all familiar with the need for safety in our veterinary practices, but the day-to-day actions may not actually match those plans. Sound safety practices offer protection to employees and patients in their care. It also protects the practice from liabilities resulting from injury. This session will look at what is needed for a well thought out safety plan, creating training program standards for employees, testing on the program and a good system to document this training. Objective: This lecture will discuss multimodal pain management and how to incorporate integrative medicine into your pain management protocols. Allopathic or traditional pain management options will be discussed in addition to an introduction into herbal medication options as well as non pharmaceutical options to improve comfort and function in dogs and cats. Objective: This lecture will discuss a variety of non pharmaceutical pain management options commonly utilized in rehabilitation practices. We will review indications, settings and dosages, as well as contra- indications of modalities such as cold laser, therapeutic ultrasound, and PEMF, and how to incorporate these into your practice. Objective: This lecture will discuss herbs commonly utilized for musculoskeletal conditions in multiple ways from building and supporting tissues to reducing pain and inflammation. Herbal monographs will be presented including botanical, phytochemical, and traditional information. Objective: This lecture will discuss herbs that have specific therapeutic effects on the nervous system to enhance healing as well as reduce anxiety and muscle tension which can complicate the experience of pain. Herbal monographs will be presented including botanical, phytochemical, and traditional information. Changing Practice Culture: Where to Start? straightforward and practical steps you can take toward improving your practice culture? Aspire CEO, in a discussion about the power and value of harnessing staff engagement. issues that are holding your practice back. Dr. Sue Ettinger is a practicing veterinary cancer specialist, international speaker, book author, and vlogger (video blogger). She is one of approximately 400 board-certified specialists in medical oncology in North America. She received her veterinary training at Cornell University College of Veterinary Medicine. She completed her residency in medical oncology at the Animal Medical Center in NYC in 2003. She has recently received awards for Exceptional Doctor Performance and the Public Relations Achievement. Also known as Dr Sue Cancer Vet®, Dr. Sue is the co-author of the Second Edition of The Dog Cancer Survival Guide, which is a best-selling book in small animal health for the last several years. She is a frequent contributor to Today’s Veterinary Practice, Today’s Veterinary Business, Clinician’s Brief, Veterinary Team Brief, &amp; DVM360. She also has co-hosted the podcast The Pet Cancer Vet. Dr. Sue is most passionate about raising cancer awareness, and she has developed “See Something, Do Something, Why Wait? Aspirate.®” to promote early cancer detection and diagnosis. Dr Sue’s popular Facebook page has over 36,000 fans. She can also be found on Instagram, Twitter, and YouTube helping clients and veterinary professionals deal with cancer in pets. Jenny has worked in veterinary medicine for 25 years. Following graduation from Northwestern State University, she received her RVT in 2001 and VTS-oncology in 2015. Jenny Spent 14 years as the head oncology technician at LSU veterinary teaching hospital, cancer treatment unit, where she worked in the clinic as a medical and radiation oncology technician. Clinical duties included, administering chemotherapy and radiation treatments in addition to managing the I131 program. Currently, Jenny serves as the treasurer of the Louisiana association for veterinary technicians (LAVT) and as the nominations chair for the academy of internal medicine for veterinary technicians (AIMVT). Jenny works as the educational director for PractiVet, providing clinical and product education for customers, distributions partners and the sales team. Jenny lives in Baton Rouge with her husband, step-daughter and a menagerie of pets. A graduate of The Ohio State University, Dr. Ford practiced small animal and equine medicine for 4 years. Subsequently, he held teaching positions at Michigan State University and Purdue University. Dr. Ford is the Lead Editor of the 2017 AAHA Canine Vaccine Guidelines and a co-author on the AAFP Feline Vaccine Guidelines. Debbie Hill, CVPM SPHR SHRM-SCP CCFP enjoys all things management and has spoken nationally at Veterinary Hospital Managers Association, Florida Veterinary Medical Association, Wild West Veterinary Conference and Atlantic Coast Veterinary Conferences. In addition, she speaks to several manager groups across the country each year on a variety of topics and has been an instructor for Patterson Management University since 2008. She is an active hospital administrator for a veterinarian with 4 practices in Florida. She entered the profession at the front desk of a one doctor practice in Denver in 1989 and has worked with 10 hospitals with 4-45 employees in 3 states, often as multiple practice settings. In addition to this experience, attends multiple veterinary conferences each year to stay current in veterinary management. While her hospitals grew, she received her Certified Veterinary Hospital Manager designation in 2005. She is also certified in Human Resource as a Senior Professional in Human Resource (SPHR) and is a Certified Compassion Fatigue Professional and uses these certifications to help manage her own teams. Debbie was a founding member of the VHMA Ethics Committee and served 6 years on the Veterinary Hospital Manager Association’s Board of Directors, is a member of VetPartners and is the current Chair for the CVPM Board of Directors. Realizing she has been privileged with a wealth of exposure to management experience and education, Debbie has a strong desire to share with others. Dr. Joseph Jordan, Chief Executive Officer of the North Carolina Physicians Health Program, has 25+ years experience in working with persons experiencing substance abuse and co-occurring disorders. He has worked in long-term residential programs and coordinated both adolescent inpatient dual diagnosis and adult and adolescent intensive outpatient treatment programs. Prior to joining NCPHP, Dr. Jordan served as Ethics Officer and Director of Special Projects for a national credentialing board. Dr Jordan has previously served on state and national committees and boards devoted to the study, development, and refinement of substance abuse counseling practice. Dr. Reck is a veterinarian with passion for creating new communication avenues with pet owners. She believes that enhancing the communication capabilities of the veterinary profession will foster a stronger connection with pet owners and create an enjoyable professional environment for veterinarians, veterinary technicians, and receptionists. In 2010, Dr. Reck published Facing Farewell, a book dedicated to providing pet owners with information to assist them with making difficult end of life decisions for their pet. In 2011, Dr, Reck opened the Veterinary Medical Center of Fort Mill. The practice quickly flourished and is now home to four full-time associate veterinarians. Dr Reck is passionate about positive culture development in veterinary practices. She is the Chief Veterinary Office and a co-founder of Aspire, which provides online leadership and management courses to help veterinary professionals build a thriving culture for their practice. Randy Hall has worked with organizations of all sizes from Fortune 25 businesses to small and midsize organizations to help them effectively execute change, develop leaders, engage employees, and reach more of their potential. Randy serves as a consultant, coach, and facilitator to help veterinary practices and companies create a culture that engages employees, dramatically improves results, and sustains growth. He leverages his animal health, sales, sales management, and executive level experience to ensure that real-world results happen for his clients. He has created learning opportunities and leadership models that enable leaders and managers to build and sustain high-performing, fully engaged teams of people. Randy spent 14 years of his career in the animal health industry. Since founding his own consulting business in 2009 he has worked with thousands of veterinary hospital leaders and staff members to help them capture the full potential of their own veterinary practices. He is the CEO and a co-founder of Aspire, which provides online leadership and management courses for veterinary professionals. Dr. Julie Reck, DVM and Chief Veterinary Officer of Aspire Dr. Reck is a veterinarian with passion for creating new communication avenues with pet owners. She believes that enhancing the communication capabilities of the veterinary profession will foster a stronger connection with pet owners and create an enjoyable professional environment for veterinarians, veterinary technicians, and receptionists. In 2010, Dr. Reck published Facing Farewell, a book dedicated to providing pet owners with information to assist them with making difficult end of life decisions for their pet. In 2011, Dr, Reck opened the Veterinary Medical Center of Fort Mill. The practice quickly flourished and is now home to four full-time associate veterinarians. Dr Reck is passionate about positive culture development in veterinary practices. She is the Chief Veterinary Office and a co-founder of Aspire, which provides online leadership and management courses to help veterinary professionals build a thriving culture for their practice. Nicole LaForest is a Registered and Licensed Veterinary Technician serving as the current President of the Washington State Association of Veterinary Technicians. She spends a majority of her time managing Mayo Veterinary Services, the largest specialty, ambulatory practice in the US; based out of the Seattle Area and primarily specializing in orthopedics and regenerative medicine therapies. Nicole currently holds degrees in Human Healthcare Management, Psychology and Veterinary Medicine. She is also the founding member and President of the Academy of Veterinary Technicians in Regenerative Medicine (AVTRM), an organization committed to making Regenerative Medicine a specialty in veterinary medicine. Robbie van Mullem is President and Chief Executive Officer of 3 Sided Media and Review Retrievers companies which develop websites, manage social media, and protect the reputation of over two hundred veterinary practices and businesses throughout the Southeast and along the Eastern Seaboard. These companies represent both large and small veterinary clinics, mixed animal practices, and specialty hospitals, ultimately reaching millions of clients and prospective customers each year. Robbie van Mullem was raised in the Hammond, Louisiana area, where he received his Bachelor of Science from Southeastern Louisiana University, while serving in the U.S. Naval Reserve. Robbie began his career in the animal health industry in 2003 with IDEXX Laboratories, where he earned the prestigious President’s Club Award, and was promoted to area manager for the Gulf States Region of IDEXX. Robbie van Mullem saw a significant void of veterinary-specific online management companies, and created his own in early 2010. He currently resides in Louisiana with his wife and two children. Dr. Seim graduated from Washington State University, completed an internship in Saskatoon, Saskatchewan Canada, and a surgical residency at the Animal Medical Center in New York City. He obtained Diplomate status in the American College of Veterinary Surgeons in 1983. He is currently on the surgical staff at Colorado State University. He was recipient of the Merck AGVET Award for Creative Teaching, the CSU Award for Instructional Innovation and selected as the North American Veterinary Conference’s Small Animal Speaker of the Year in 2009. Lynne Swanson, DVM (Cornell ‘86) has shaped and lived with psychologically healthy and happy groups of ten to forty dogs for three decades, and she is proud to be part of an educational effort recognizing the many things we can learn from our canine companions (when we are open to the possibilities). In 2005, she helped to create Safe Harbor Farm K9 Rescue & Rehabilitation Center in coastal NC, and in 2013, she helped develop the Learning "DOG" project for animal shelters. She is the author of two books: “Learning DOG” (2015 - for shelters, boarding and training facilities) and “SMILE! and other practical life lessons your dogs can teach you (while you are training them)” (2017 - for everyone). Dr. Julie Wentzel grew up in Annapolis, Maryland, and graduated from Virginia Tech with a Bachelor of Science in Forestry and Wildlife in 1998. She graduated from the University of Illinois, College of Veterinary Medicine in 2004, where she pursued interests in both wildlife medicine and small animal emergency medicine. After graduation, she completed a small animal emergency medicine internship at Anne Arundel Veterinary Emergency Clinic in Annapolis, Maryland, where she remained on staff for another seven years. She completed her Certified Veterinary Acupuncture courses in 2013 and became a Certified Veterinary Pain Practitioner and Certified Canine Rehabilitation Therapist in 2014. Over the course of her career, she has become a firm believer in a whole-body approach to health both in her professional and personal life. She strives to implement an integrative approach to medicine to improve her patients&#39; lives and assist in their return to a more comfortable and active lifestyle. She recently completed an apprenticeship in Western Herbal Medicine and is excited to offer this to her veterinary patients. Dr. Wentzel is currently the Treasurer of the Northern Virginia Medical Association in 2017. In her free time, Dr. Wentzel enjoys spending time with her family, as well as gardening, bird watching, volleyball, and running. She lives with her husband, their three children and one cat in Leesburg, Virginia. Arrowheads point to good luck, so follow them to Harrah’s Cherokee Casino Resort. North Carolina’s first casino, Harrah’s promises an electrifying adventure that’s bound to put a smile on your face and, if you’re lucky, a bulge in your wallet. Harrah’s Casino is home to a 21-story, four-star, luxury hotel nestled in the beautiful mountains of Western North Carolina. The 1,108 spacious rooms include amenities such as large baths, upscale furniture and fixtures, and 42-inch HD plasma TVs. In addition to these amenities, guests have access to an arcade, indoor pool and workout room, as well as a 15,000-square-foot conference center and several delicious restaurants. Eight unforgettable suites are located in the Mountain Tower, 21 in the Soco Tower, and 78 in Creek Tower. Bask in the earthly pleasures of Mandara Spa. Inspired by elements of native culture and Balinese-influenced treatments, Mandara Spa brings casino guests the highest quality of therapeutic luxury. The Mandara brand emphasizes beauty, rejuvenation, and exotic indulgence, aiming to enhance each guest’s resort experience by providing luscious opportunities for pampering. Ease and enjoyment for all ages. We know every moment of your time here is important so we provide convenient check-in and checkout kiosks in various locations throughout the hotel. Ask about our “Stay and Play Packages” to take advantage of every opportunity. If you are traveling with children, stay at the casino and let the kids explore the arcade while the adults hit the gaming tables, or take some time and enjoy outdoor activities like hiking, biking,tubing, and much more. Traveling with canine companions under 50 pounds? Ask about our PetStay room benefits. "The luxurious 21-story Harrah’s Cherokee Hotel is set amid the beautiful mountain setting of western North Carolina and provides luxury lodging that creates an upscale experience with 1,108 spacious rooms that include breathtaking views. Check-in/Checkout Kiosks are available in the hotel for fast service and are located on the 2nd floor of the hotel. Enjoy many amenities like the fitness room that is open 24/7, the indoor pool and our new outdoor pool featuring a zero entry pool, cabanas and bar area." An enterprise of the Eastern Band of the Cherokee Nation, located in the heart of the Great Smoky Mountains of Western North Carolina, Harrah's Cherokee Casino Resort is celebrating over 15 years of operation since opening its doors in November 1997. The Casino has 150,000 square feet of gaming space and offers 3,800 slot machines and over 100 traditional table games such as black jack, roulette and craps. The property also features over 1,100 hotel rooms, the Le Fu Men gaming area, 10 restaurants, the Essence Lounge, a 3,000 seat Event Center, the luxurious 18,000 square feet Mandara Spa and eight retail shops. In addition to the 56-acre property, guests have privileged access to the Eastern Band of the Cherokee Nation-owned Sequoyah National Golf Club, named one of Golf Magazine's best new golf courses. A culture, a people, and a place that's actually a sovereign nation, Cherokee is located right in the heart of Western North Carolina. It's also base camp for hiking in the Great Smokies, arts and crafts shopping, native elk herd viewing, hours of fishing fun, and home to a history that spans millennia. Ready? Let’s go. Discover the fun of seeing the world through Cherokee eyes. It might happen on a mud-spattering romp through the nearby Great Smoky Mountains. Or while hearing the creation legend in the Museum of the Cherokee Indian. You’ll be having fun in Cherokee, relaxing, and suddenly, you’re a little more in tune with the natural world. With just one visit to something as profound as the outdoor drama “Unto These Hills,” you can’t help but look at things a little differently. And you’ll certainly have more fun. How will Cherokee affect you? Plan. Play. Visit. And discover. Each place you visit in Cherokee pulses with the stories and significance of a people whose roots run deep and whose ancient wisdom is fascinating to uncover. Nestled in the lush landscapes of Western North Carolina, Cherokee invites you to smell the wood smoke and open your ears. If you listen closely, maybe you can hear the chanting of the little Nunnehi people of the mountain peaks. No need to resist Cherokee’s invitations to dive right in. Fire off a blowgun if you dare, but make sure your spouse is in the clear. As you cast your line into the trout-filled rivers or wash your face in the sweet spray of a waterfall, let the powerful feelings of Cherokee carry you. Even if it’s just for a day or two. Open your eyes with us. A virtual treasure trove of outdoorsy fun awaits in Cherokee. Activities gain new dimensions as you become aware of their origins, steeped in a vibrant cultural heritage. For instance, if you enjoy birding, you may never see the cardinal in the same way after learning about the legend of how it got its scarlet color–just as you may observe in a new way the copper lines in the ancient boulders along the banks of the Oconaluftee where you may be fishing, tubing or kayaking. Did you know that the wolf showed the cardinal those copper lines to paint herself with after she pecked the mud from his eyes? These are stories you and your fellow travelers will learn as you explore Cherokee. Cherokee history, song, dance, and period regalia come to vivid life in sites such as the Oconaluftee Indian Village, the outdoor drama “Unto These Hills,” or the Museum of the Cherokee Indian. Cherokee hosts a variety of annual cultural festivals throughout the year where you can share in the celebration of colorful customs and learn about ancient beginnings. Let your braids fly in downtown Cherokee. Nostalgic shops offering blowguns and tomahawks, comfy motor lodges, family fun parks, and petting zoos can all be found in downtown Cherokee, NC. If you’re looking for something extraordinary, consider playing the 18-hole Sequoyah National Golf Course designed by Robert Trent Jones II, then staying at Harrah’s Cherokee Casino Resort.